Bainbridge® Artcare Archival Foam Board features MicroChamber® technology which absorbs and neutralizes harmful gases before they damage the art. Neutral pH surface with a toothy texture for better adhesion. The opaque, lightly textured surface paper eliminates show-through and features a soft white color that is suitable for floating applications. See Pallet Delivery requirements for 11x14 and larger backing. Shipping quotes are subject to change based upon actual freight cost. Corrections will be made on final invoices to reflect actual shipping costs. ClearBags® does not accept returns on backing or foam board. Give your treasured art and photos the archival protection they deserve. Bainbridge Artcare Foam Board is made with MicroChamber technology to absorb and neutralize harmful gases before they can damage your art. 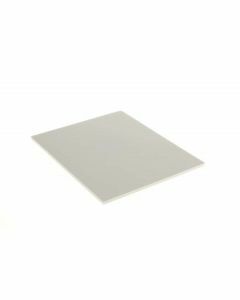 This soft white FOMD8 foam board is ideal for mounting and framing 8" x 10" art, photos, collectibles, and more. Bainbridge Artcare Foam Board provides archival safe protection from top to bottom. The FOMD9 measures 9" x 12" and is ideal for archival mounting and framing of fine art, photos, historical documents, collectibles, and more. MicroChamber technology absorbs and neutralizes harmful gases before they can damage your art. Bainbridge Artcare Foam Board offers high-quality conservation mounting of artwork and photos. Our FOMD811 foam board is ideal for mounting and framing 8 1/2" x 11" art, photos, historical documents, certificates, and more. This soft white board absorbs and neutralize harmful gases before they can damage your art and is archival safe. Bainbridge Artcare Foam Board is the perfect solution for archival and conservation mounting. Our FOMD12 foam board measures 12" x 16" and is ideal for mounting artwork, presentations, photographs, and historical documents. This soft white foam board provides two-sided protection from damaging pollutants and harmful gases. Why not give your artwork and photography the highest quality of archival protection available? Bainbridge Artcare Archival Foam Board is truly archival. This board is constructed with technology to trap and neutralize harmful gases before they can damage your art. Textured, toothy surface offers better adhesion.